I recently rediscovered this little tool in the bottom of my make up bag. 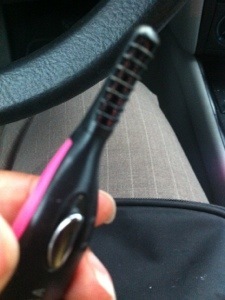 It is small but easy to use and packs a big lash curling punch. Think curling iron for your eye lashes. I give this 2 thumbs up!!!! I have been having issues with cracking and dry lips. After some reasearch I have found that my lips need sunscreen and that my lips are being damaged by all the cheap lip gloss I have been using. I made the switch lip balms and now find the pink color returning to my lips. The cracking and constant need to lick my lips vanished. There are so many balm options out there but the one I love the most is the new revlon balm. It has great color and a natural shine. It is definately worth a try!